Leviathan is different from demons. This video gives you diagnostic tools and strategies for extracting a recalcitrant Leviathan. Cost includes 428 days of access after purchase date. Leviathan has a far higher success rate at staying in a person than a demon because it is subtler. Arthur explores a wide variety of Leviathan-induced symptoms that are sometimes considered as medical issues and sometimes simply ignored because they are not acute. No one of these indicates that Leviathan is involved, but when you have several of these, you should at least consider Leviathan as a possible source. Next, we explore the seven wet areas of the body where Leviathan is most often established. First and foremost is the cerebral spinal fluid in the brain. The implications of Leviathan moving in the fluid of your brain are immense. Also, extremely common is Leviathan in your kidneys. Leviathan is also implicated in the inability to sleep. We explore the pineal gland and melatonin to show when and where and how Leviathan can compromise the normal functions of getting to sleep. 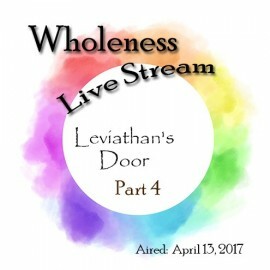 Deliverance for Leviathan is somewhat different than deliverance from demons. Leviathan has little interest in your confession and the legal system that we use for evicting demons. Nonetheless, there IS a strategy that is effective for extracting this spirit. People are far more apt to be reinfected by Leviathan than by demons in general. This is partly because of ignorance, partly because of an open door in the brain stem. Holy Communion dealt with warfare against the open door that allows continuing reinfection by Leviathan. What I love about this live stream, is that Arthur brings part of his own testimony into this, sharing some of his experiences, and shows us how he applies the principles! To me - it's building intimacy in our Sapphire family in the Mercy Season way! Here’s the thing about Leviathan: It’s real, it needs to be kicked out, and stay out! And there's more. And for a “half-baked potato,” this live stream surely was solid-and-true to me, with a distinctly different flavor – utterly unemotional, without drama for me, yet incredibly real. I appreciated much about this, including the discourse on doors. Ultimately, our God is big, bigger, and biggest, the God of order and not chaos. What He opens no man can shut, and what He shuts no man can open. Leviathan’s door needs to be shut. Forget fear – to dive with a mustard seed of faith into this one, as often as necessary, can give unstoppable, unshakeable joy a chance. Soooo worth a half-baked potato, and more. Great teaching and practical exercise to do after the warfare through communion. Thank you precious Godhead. So much appreciated. Do you ever struggle with low grade depression? It is too mild and too intermittent to go to the doctor. You don’t want anti-depressants anyway. Might be Leviathan! And pills won’t fix that.